Seb Shelton, former drummer of Dexy’s Midnight Runners and editor of the magazine “Sounds” kindly provided a copy of a review he made for the January 1981 issue. The picture shows the “batwing kit” which had been exhibited at a music trade show in London in early 1981 together with a set of heart shaped pads and a set of … hexagonal shaped pads. DRUM SYNTHS currently on the market provide, to my mind, interesting, expensive additions to acoustic drum kits but little else. Now for something completely different! The SDS V Modular Drum Synthesiser is capable of producing synthesised percussion sounds and acoustic drum sounds ranging from Rototoms through to standard rack toms, timpani, bass drums and snare drums. Difficult to believe isn’t it? However, after spending two afternoons pawing the set-up, I believe that these could adequately replace standard acoustic drums for most studios and live work. A prototype SDS V was first shown to the unsuspecting public a few months back at the British trade show and was the result of over two years’ work by Dave Simmons who had previously designed Britain’s first indiginous production drum synth. By the time you read this a six-piece production version of the SDS V will be available as well as limitless custom variations, ranging from one module (drum) upwards in any shape, size and colour. The basic idea for the set-up is simple. Electronic modules have been specifically designed to reproduce sounds created by a single item from a standard drum kit (ie snare, bass drum etc) and are linked up to a touch-sensitive pad. The shape and size of the pads is obviously immaterial as it is the modules which are responsible for the sound. Of course, the real technology comes in incorporating the controls needed to simulate the performance of acoustic drums. Thus the SDS V has ‘hiss pitch’, ‘tone pitch’, ‘bend’, ‘decay’, ‘balance’ and ‘click balance’ features. These terms are pretty self-explanatory so suffice it to say that with a bit of knob twiddling I got some ‘acoustic’ drum sounds which really shocked me, not to mention the normal range of typical electronic percussion hisses, pings, whoops and cracks. This was all achieved with standard controls and the aid of a battered old mixer/amp through an equally battered old bass bin and horn unit. What is exciting about this outfit is the prospect of linking it up to a sophisticated studio or live mixing desk. In this situation each drum sound could be refined to a much greater degree, and all of the ‘effects’ which can so easily be applied to other electronic instruments — echo, flanging, phasing etc — added to your electronically produced acoustic drum sounds. The proposed production model consists of five identical 11 inch hexagonal pads acting as hi-hat, snare drum and three rack toms, plus a 22 inch hexagonal pad for the bass drum. Each pad consists of a black or white perspex playing surface backed by about two inches of hardwood. The edge of the perspex is protected by a metal rim and each pad is connected to its respective module by Cannon connectors. The six modules are fitted together into a 19 inch rack complete with power supply. Finally the pads are mounded into a playing position via two of the excellent Pearl Variset series of floor stands. There’s little else to comment on in the hardware department other than the huge spurs on the bass ‘drum’ which make it immovable when playing. Sensibly no bass drum pedal is supplied with the kit; the bass drum pad is of course designed to be triggered with a pedal but because it’s touch sensitive it could equally be triggered with a stick, which opens up a whole new set of playing possibilities. For example rolls could be played on the bass drum using sticks getting the same kind of power and sound as if playing them with a pedal, but without the legwork. Alternatively a combination of stick and pedal could be used, or the bass drum module could even be plugged into the snare pad and triggered that way. Magical, huh? The hi-hat is again a pad but this time a pedal is supplied and it works like a volume pedal. When playing with the pedal depressed the sound from the pad/module is the ‘tick-tick’ of a closed hi-hat, and with pedal ‘open’ it’s the sizzle of a part opened hi-hat. It can also be played with the foot like a normal hi-hat. Of all the modules this was the most difficult to get a good, natural, quality sound from. In the basic playing position it lacked some of the bite of a good pair of cymbals and there was no bell sound available. However, an acceptable sound can be produced. The rack’s control panel has, in addition to the six knee of knobs, a square of four push-buttons which control the four memories of the system. The top left hand button calls up a preset sound for each of the pads but the remaining three are free and can be programmed according to the player’s requirements. Thus at the push of a button four different sounds are available far each pad. 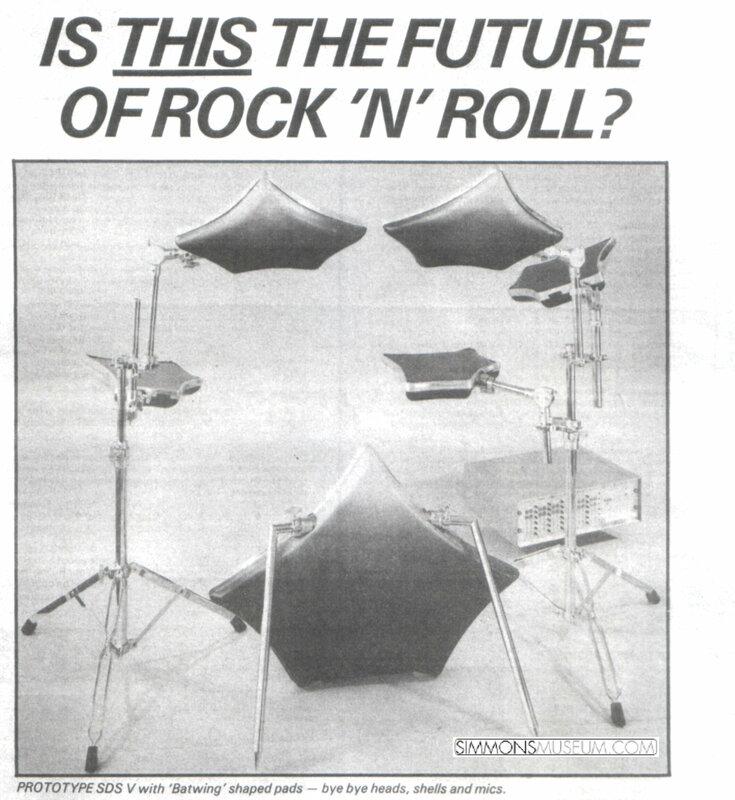 So in effect there’s a possible 20 drums and four hi-hats in front of you when the memories are programmed. Obviously this is not quite as effective as having all those drums and cymbals physically there because you have to push buttons to ‘create’ them, but from a collection of little pads it’s not bad! So far, so good, but a couple of obvious queries need to be cleared up. Rimshots for instance. When the outer metal rim of the pad is struck simultaneously with the pad, there is a change in tone and increase in volume as with a standard drum. But to achieve the higher-pitched type of rim shot used a lot in reggae and ballads, one needs to employ one of the memories and create that sound electronically. Another point. At first I thought devotees of the finer drum skills such as brushwork might be at a loss with the smooth perspex pads but the answer is simple — fit a rough surface to the pads. Undoubtedly there’ll be a few raised eyebrows and the claims made for the SDS V that it can replace acoustic drums in modern music will be disputed. Two thousand years of tradition are, after all, quite an obstacle. However, providing it stands up to the rigours of eye work, the advantages are too overwhelming to ignore. Obviously the different response of a hard playing surface is something to get used to but I find the perspex a positive advantage. On acoustic drums it’s visually impossible to apply many sticking patterns if the heads are tuned down, but this problem doesn’t exist with the SDS V.
Also as there are no conventional heads there are no worries about detuning during playing, unwanted snare buzzes or general overtones. Consider too, apart from needing no microphones, the advantages of being able to increase drum volume via the ‘drum stack’. No doubt other advantages will become apparent with time (and perhaps drawbacks too) but all I have to add at present for the doubtful among you drummers is: remember those who thought the electric guitar would never catch on. Where are they now? This entry was posted on Saturday, April 27th, 2013 at 2:44 pm and is filed under Report, Stories and Gossip. You can follow any responses to this entry through the RSS 2.0 feed. Both comments and pings are currently closed.